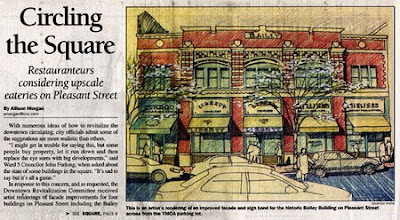 We need an artists’ community in Malden - a community will play a significant role in revitalizing the City because:- Establishment of art-related businesses will lead to more income for local businesses, the 24-hour working habits of artists will help to keep our neighborhoods safer, the creation of educational partnerships with local institutions will enrich the art and cultural life of our community. Revitalizing Malden Square through the ArtsIn the ongoing effort to revitalize Malden's downtown area, the City of Malden is reaching out to all artists to get their ideas on how they can be part of the revitalization process, creating artists live/work space and art related business opportunities in the Malden Square area. who has first-hand experience about the exodus of artists from places like Boston's South End and Fort Point Channel. 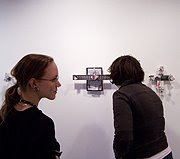 who has been involved in creating strong community-based arts programs that serve artists of all ages and backgrounds, including the Windows Art Project in Somerville's Davis Square, as well as exhibition and educational programs in Arlington and Greater Boston. who has experience in revitalizing Boston's commercial districts. & to celebrate Malden Square's promising future. When: Wednesday evening, Feb 26, 2003, 6 p.m. to 8 p.m.
Refreshments will be served. Validated parking available at the Florence Street Parking Lot behind the Heritage Apartments. This open discussion is sponsored by: The Office of Mayor Richard C. Howard, Malden Redevelopment Authority, The City Council's Downtown Committee, and artSPACE@16, Malden. For more info, contact: Deborah Burke at the Mayor's Office, 781-397-7000, or Sand T at artSPACE@16, 781-321-8058. My name is Sand T. I am the director of artSPACE@16. I collaborated with the City to organize this open discussion: Revitalizing Malden Square Through the Arts. Dinah Cardin, a writer for the Malden Observer, asked me a question during the reception for artSPACE@16's Malden Art Now 2003 exhibit. She asked if I am the voice of the artists' community in Malden. At this point, I don't believe I can presume to speak for all Malden artists. I can tell you that I represent myself as an artist who has a strong desire in wanting to see a vibrant artists' community established in Malden. I can also say, with certainty, that I want to continue to contribute to the art and cultural life of our community. I am a voice that has felt it important to call out to the artists in our community. The responses I have received have prompted me to the gathering here this evening. Tonight we will have an opportunity to listen to experienced voices concerning local arts communities. Tonight is also a chance for us to talk over ideas and voice your thoughts on a revitalization process and the role artist's can play. Share your vision of how an artists community can work with the city to create mutually beneficial results. While the City has continued to put in effort in revitalizing downtown Malden, an artists community could play a part in this process like many neighboring communities have successfully accomplished. #1 - create art-related businesses which could result in the creation more jobs and generate more revenue for local businesses. 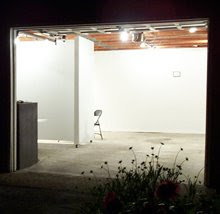 #2 - Create an affordable artist live work building in which the practicing artists can purchase or rent a unit or space. And #3 - Create more contemporary art galleries and possible art center, which in turn would generate educational partnerships with local institutions. Efforts in the works to attract artists to city - by Dinah Cardin / Malden Observer / 03-05-03 - City officials are continuing to ask how to bring more life into Malden Square.